GREENWICH VILLAGE, Manhattan (WABC) -- A 22-year-old woman was groped and pushed into the subway tracks in Greenwich Village Friday morning. Police released photos of a person they want to question on Friday night. An unidentified man approached the woman from behind while she stood on the northbound platform at the 14th Street station at around 4:20 a.m., authorities said. He grabbed the lower front of her body. She told him to stop, and he shoved her onto the tracks in a random attack. Two Good Samaritans rushed to her aid and helped her back onto the platform. No train was approaching at the time. The woman, a stage actress, suffered a broken wrist and was taken to a hospital for surgery. She was on the way home to Washington Heights when she was attacked. 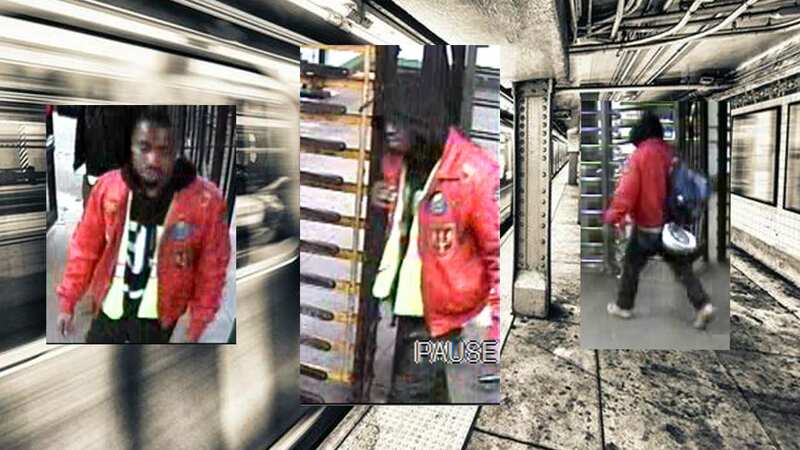 The person of interest sought for questioning is described as a man in his 20's, approximately 5'10"-6'0" tall, medium complexion, black hair, goatee, brown eyes, and was last seen wearing a red bomber jacket with multi-colored patches, a black hoody, black denim jeans, carrying a blue back pack, a white construction type helmet, and light colored shoes.